By 2020, Audi wants to be the leading premium manufacturer of electric vehicles with annual sales reaching six figures. One of the vehicles that will lead the electrified charge is the range-extended A1 e-tron. This is the second-generation range extender that operates in both series and parallel hybrid modes — the gasoline engine is used to charge the battery and drive the car. 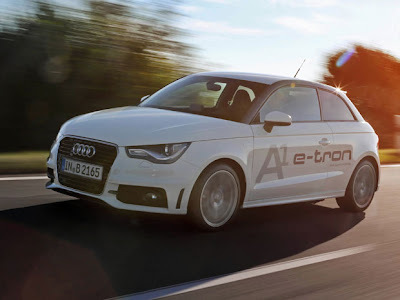 The A1 e-tron features two electric motors, a 1.5-litre three-cylinder turbocharged gasoline engine and a 17.4-kilowatt/hour lithium-ion battery. The petrol engine produces 127 horsepower and 147 pound-feet of torque, while the main electric motor chips in with 113 hp and 184 lb-ft of torque. The second electric motor, which is rated at 67 hp and 155 lb-ft, is normally used to start the engine and act as a generator to recharge the battery. However, if the driver goes to wide-open throttle, it joins the main electric motor in powering the A1. With all three sources giving their all (the so-called boost mode), the A1 e-tron puts a net system output of 175 hp at the driver’s disposal. Where the A1 differs from many hybrids is that it uses a single-speed transmission — the lone gear is roughly the same ratio as sixth gear in Audi’s twin-clutch gearbox. As such, the engine only drives the A1 at speeds above 55 kilometres an hour. The reality is that this does not affect the way the car drives at all — the main electric motor begins to twist out its peak torque the instant it begins to turn. In the lightweight A1, this brings a spirited launch off the line and a run to 100 km/h of less than nine seconds. The driving range is remarkably good. The A1 e-tron can travel on electricity alone for up to 90 km. Beyond that, the extended-range portion provided by the gasoline engine delivers a total driving distance of 600 km. In the end, the A1 e-tron consumes just one litre of gasoline for every 100 km it is driven!